QUADRE is a self-managed ensemble. Our strategy for booking concerts is two fold. private homes. These events give us a chance to regularly connect with our local supporters. They also give us the opportunity to try new things out programmatically. our online research of venues in different geographic areas, and our own personal contacts. income coming from merchandise sales (sheet music and CDs). possible. After ten years in the business, it is easier although it is still a constant challenge. 2. What different players have you had in the quartet? everyone who has been involved in QUADRE has made it what it is today. 3. Do you have a member who is the leader/decision maker? artistic decision is made without all the artists in the group being informed and providing input. 4. How do you solve artistic differences during rehearsals? can be a great way to measure the success of an idea. 5. How many concerts do you perform a year? 6. What made you want to create a horn quartet and what do you like about chamber music? a huge fan of the Four Freshman, The Four Aces, The Four Lads, and in particular, the Hi-Los. would be possible to do something similar with a group of like instruments. genre. After a few months, it became clear that four of us wanted to make a go of it as a quartet. As for why I like chamber music, I think the ability to make music in a small group is exhilarating. discussions, home-stays, and communications (email and letters). 7. What rehearsal techniques do you find most useful when learning new music? 8. What are the future goals of Quadre? artists. We also plan on touring internationally more in the future. 9. What has been the most rewarding aspect of being part of Quadre? very rewarding to see the group continue to thrive after ten years. communication outlets is to being a viable quartet? presence is another way to get your message out about who you are and what you do. 11. Anything else you would want me to know/present about Quadre that is not on your website? that same passion to our music. What blog on non-western instruments can be complete without discussion of the Hebrew shofar? The shofar, similar to the previously mentioned Kudu, is made from the horn of the Ibex it is still in use as part of Jewish ceremonies. Although it is on the fringe of Western culture, it is still exotic religious enough to most Americans that I thought it should have some mention here. There are many versions of the instrument of different sizes and designs is use today(many now have finger holes), but the original instrument was the unaltered horn of the Ibex. You can read more about them here. This website has a lot of resources for people interested in world music. I have used it to find pictures and information for a few of my posts. ASZA is a performing chamber group that specializes in learning world music from many different cultures. Their website has profiles of major world music groups, recording for purchase, instruments for purchase, a calendar of major world music events, instrument picture gallery, and much more. You can visit their site here. I can't believe I forgot about Jeff Agrell's kudu horns. 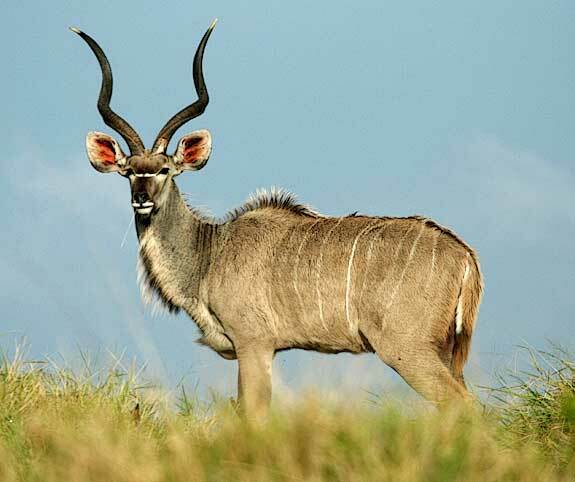 Pictured is a Kudu, a type of Gazelle, and the instruments made from their horns. The set Jeff has is pitched in E pentatonic (each horn plays one note). The highest pitched horn has a finger hole so that it will play two notes. These horns are played all over Africa and are usually used in a rhythmic hocket texture often accompanying a marimba. You can read more about them as well as some other African instruments here. 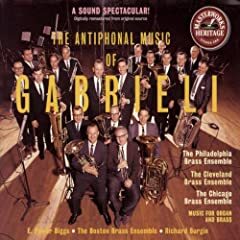 The Gangbe` Brass Ensemble is a fusion brass ensemble that combines jazz with the traditional folk music of Benin (a small country in Africa in between Nigeria and Togo). It was founded in 1994 by 8 jazz musicians who wanted to experiment was traditional folk music. The music incorporates brass, vocals, and percussion. They have released 3 albums and have toured worldwide. You can read more about them here and here. Every year a small villiage in Serbia holds a brass festival. You can read more about it here. The music on the website is quite amazing. This year the festival is August 6 through the 10th. This is a video of some of the festivities from the festival in 2007. I think this is more of Peter's realm, but I found it amusing. I was watching fox's King of the Hill, and had another Mangione sighting. There was a portrait of him on the wall of a marriage counselor's office. He discusses it in an interview here. When I was originally researching Tibetan m montanous usic for my historical perspectives paper, I came across some other instruments that were not involved in the Tantric ceremonies I was interested in. this brass conch shell, or Dung, is one such example. What I find very interesting about this instrument is that it meant to resemble a conch shell......and tibet is a land locked mountainous region. This is a Vietnamese Dan Moi. It is made of very thin brass and carried in the small bag shown. It is a very popular instrument even today in Vietnam and is now commercially produced. Read more about them here. New York Death + Discovery Channel=Fun Fact: The first know professional musician was employed in egypt 5000 years ago. Fusion of old and new music genres has become very popular in the 21st Century. Phil Thornton has recorded two Albums based on traditional Buddhist Tantric chants. 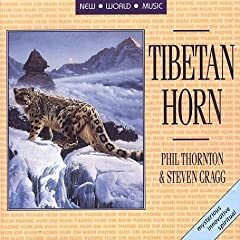 Although I expected a little more horn from an album labeled "Tibetan Horn," the combination of traditional motifs and instruments combined with electronic instruments and other New Age medium create a unique experience. It has become a popular CD for meditation studios. (Smoking drugs may enhance the experience although I do not endorse this). Available at Amazon.com for pucase and download. This is an example of the effect the 400 years of British rule has had in India. The mixing of traditional Indian music and instruments clashes with the British brass band tradition. This idea is very present in Indian pop music (Baliwood). Recording session at Thailand Cultural Center, Bangkok, during 27-28 November 2006.e.